Autumn began almost a month ago, but the weather here in the Northeast was slow to catch up. Today it did, however, with a swampy 80 degrees giving way to leaf-rustling winds and low 60s, just in time for this weekend’s Hearthstone Fall Championship. The pull of Dragon Ball Z continues to bend the rest of nerd culture toward it, as evidenced by two of the tournament’s top competitors’ preferred esports handles. David “Justsaiyan” Shan, a favorite to win the Fall Championship, hails from the United States and plays as part of team Tempo Storm. 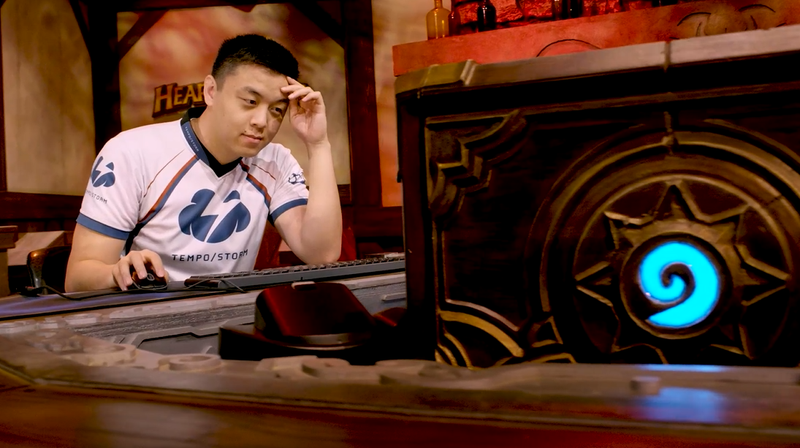 Despite occasional setbacks, the last few months have seen Justsaiyan come out of the shadows of his stellar teammates to establish himself as one of Hearthstone’s rising stars. Justsaiyan is currently ranked second in the world, and the number one player, Casper “Hunterace” Notto, isn’t at the tournament. This could pave the way for Justsaiyan to be dominant, which he’s already demonstrated by picking up three early wins and skyrocketing himself to the top of Group B. Favorites have a tendency to falter at these types of events, however, so Saiyan will have to show he can still hang when it counts. He “LPTrunks” Huan, meanwhile, comes by way of China, where he’s been able to stand out in a competitive region but struggled to remain consistent. He heads Group C where he’ll face his first challenge, Eden “Hatul” Zamir from Israel, in a best of three series that begins today, Friday, at 2:30pm ET. LPTrunks likes to battle aggressively, not unlike his fictional namesake, and has brought Zoolock, Odd Rogue, Malgos Druid, and Tempo Mage decks to this weekend’s tournament (which are identical, in fact, to his training partner, China’s Liu “Islandcat” Chang, who’s heading up Group D). Should Trunks and Justsaiyan meet along the way to the grand finals, it’ll be interesting to see which strategy wins out and whether younger faces like those of Taiwan’s Wu “BloodTrail” Zong-Chang can throw the eventual knockout stage bracket into disarray. Play starts each day at 11:30am ET with the final top-eight play-offs taking place on Sunday. While the winner will be crowned champion and win the lion’s share of the $250,000 prize pool, tall top four finishers will be invited to compete in the World Championship next month at BlizzCon. All of the games are streaming live on Blizzard’s Hearthstone Twitch channel. If Hearthstone isn’t your thing but you love people staring at colorful rectangles while announcers rattle off incomprehensible proper nouns, there’s also the Gwent Open this weekend. CD Projekt Red’s Witcher card game launches later this month on October 23 alongside a single-player campaign, but for one last hurrah with old Gwent prior to the upcoming overhaul you can watch talents ranging from the UK’s Freddybabes to Poland’s Adzikov square off in Warsaw for $25,000. Matches start at 10:00am ET on both Saturday and Sunday, and Gwent’s tournament organizers never fail to put on an elaborate show, complete with detailed Witcher-esque sets and costumes. All of it will be available to watch live here. In other esports Worlds, the massive annual League of Legends tournament, is still ongoing. Group matches continue through the weekend before the knockout stage gets underway on Friday, October 19. For this weekend, matches start Saturday and Sunday morning at 4:00am ET. On the American side, Cloud9 and Team Liquid will both be looking to edge their way into the top half of Group B and C respectively, though Cloud9 has a tough road ahead with a match against China’s Royal Never Give Up, who is currently loss-less. You can stream all those matches over at Riot’s Twitch channel.